Diabetes is a condition which occurs when the amount of sugar in the blood is too high because the body cannot use it properly. There are two types of diabetes, one is controlled by tablets and diet and the other is controlled by taking insulin. Both types of diabetes can result in complications of the eyes. The most serious condition is diabetic retinopathy. People with diabetes are at risk of losing their sight due to a condition called diabetic retinopathy. It can affect anyone who has diabetes, whether they are being treated with insulin, tablets or through managing their diet. Diabetic retinopathy affects the blood vessels supplying the retina and if left untreated can permanently damage a person’s sight. Not everyone with diabetes will develop the condition but they will be at risk. Ensuring the diabetes is controlled and well-managed will reduce the likelihood of developing sight problems. 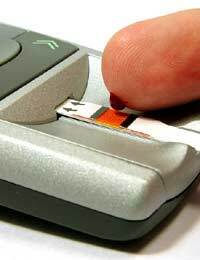 It is vital for people with diabetes to have regular screening for the condition. There may not be any symptoms and you may not realise that there is something wrong with your eyesight. Regular screening will ensure it is picked up early so that treatment can prevent any sight loss. If you have diabetes and are currently not being screened for diabetic retinopathy, ask your GP to refer you to a programme. Some opticians carry out screening as well but this varies in different areas. Your local optician will be able to tell you about services in your area. Your diabetologist can also examine you for diabetic retinopathy. Although screening programmes are effective for detecting diabetic retinopathy, they do not check for other eye problems or eye diseases. It is therefore important for people with diabetes to have a full eye examination. Do not wait until your eyesight has deteriorated before you have an eye test. Anyone who has diabetes is entitled to a free NHS sight test. Diabetes can affect the blood vessels in the eye, which causes damage to the retina. The retina is an important part of the eye as it enables us to focus and see clearly. The centre of the retina, called the macula, is a crucial part of the retina as it is this part which allows us to see fine detail and read small print. Other parts of the retina allow us to see things to the side, this is called peripheral vision. When the blood vessels feeding the retina become blocked the eye attempts to repair itself by forming new blood vessels to restore the blood supply to the retina. The problem with this is that the new blood vessels are weak and grow in the wrong place. They grow on the surface of the retina and on the vitreous – a clear, jelly-like fluid which fills the inside of the eye. These newly formed vessels often bleed and cause scar tissue in the eye. This scarring pulls the retina which can lead to a retinal detachment – where the retina is pulled out of position. Consequently, your eye sight will become much worse and may be blurred or patchy. If it is not treated retinopathy can lead to blindness, which is why it is so important to have your eyes checked regularly. Laser treatment is available for diabetic retinopathy which is painless and very successful. The earlier the condition is picked up, the greater the chance of preventing any sight loss. However, laser treatment will not restore sight which has already been lost but further damage can be limited. The laser is used to destroy the damaged parts of the retina and also to stop the growth of new abnormal blood vessels. Leaking blood vessels are sealed to prevent any further damage to eyesight. Treatment to remove new blood vessels is more invasive and can be more uncomfortable. It is possible to take a pain relieving tablet or in some cases have an injection around the eye to numb the pain. You should talk to your eye specialist if you have any questions about pain relief. You will not need to stay overnight in hospital as the treatment can be carried out in an out patient clinic. Eye drops are used to make your pupils larger so the surgeon can see clearly to the back of the eye. The eye is numbed with eye drops and a special contact lens is placed in your eye to stop you blinking. A high intensity light is then beamed onto your eye to treat the damage. As with any surgical procedure there are always some risks involved and there is a possibility of complications. However If you have diabetic retinopathy the benefits will out weigh the risk of not having treatment. If the condition is left untreated it can lead to severe sight loss and blindness.